South Jersey’s best places to unplug are hidden in plain sight. Outsiders may think of Camden County as the most densely populated county in all of South Jersey, a hub for commerce run through with traffic-clogged highways. But that’s not how Frank Pearce sees it. The longtime Voorhees resident and avid outdoorsman may like the convenience of suburban living, but what’s even better: the proximity, just a few minutes away, of tranquil lakes for canoeing, little-trodden hiking trails and even virgin wilderness for the occasional bushwhacking expedition. Pearce, who gets his off-the-grid kicks as activities coordinator for the 1,200-member-strong Outdoor Club of South Jersey, says his favorite place to unplug is in a canoe in the middle of the Wharton State Forest’s Atsion Lake, just a few minutes’ drive from home. From small but serene neighborhood parks to vast state forests that link up with the 50-mile-long Batona Trail (appropriately, it’s short for Back to Nature, given that the hike is as good as a rapid airlift out of the world of jug-handles and into the depths of the Pine Barrens), South Jersey offers countless opportunities to escape from the smartphone radius and to turn left at will. There are miles of hiking trails ranging from wheelchair-accessible boardwalks to wilderness adventures, hidden streams just wide enough to navigate by canoe, and enough bike paths, campsites and lakes to try someplace new almost every weekend. Thanks to open-space preservation programs by local counties and nonprofits, the number of such places open to the public is growing rather than shrinking: Burlington County, for example, has preserved more than 20,000 acres of farmland and other open space through its conservation programs, while Gloucester County has kept more than 15,000 acres permanently free from development. And local outdoor advocates make it their mission to extend and improve trails. The Outdoors Club recently helped the New Jersey Conservation Foundation move a segment of the Batona Trail off the perimeter of Route 70 onto the Franklin Parker Reserve, along conservation land, cranberry bogs and the previously cultivated blueberry fields where now-wild berries still grow ripe for picking. And, says Pearce, the club helped improve another two and a half miles of trail in Bass River State Park. Of course, if you’re afraid of the Jersey Devil, there’s another option—and it’s hidden in plain sight. Sure, the Delaware River may not look like a natural playground from the Ben Franklin Bridge, but just a few miles upstream, nature parks offer peace, quiet and unbeatable water and skyline views. Amico Island in Delran has waterfront picnic spots and a few miles of easy trails, while Palmyra Cove Nature Park offers picture-perfect scenery and lots of educational programming. Similarly, the Rancocas Creek presents recreational opportunities in our backyard, like the waterfront Long Bridge Park with its 115 acres of wetlands, marshes, ponds and forests, perfect for picnicking, fishing, hiking through a ravine or ducking behind a blind to observe red-tailed hawks and great blue herons. And, in Gloucester County, Big Timber Creek has slowly been transformed into a recreation destination, thanks to new trails and a canoe launch off of Old Pine Farm Preserve. Likewise, there’s no need for hikers to travel far from home to find unspoiled scenery and wildlife. Croft Farm, just a few minutes from busy commercial areas, is home to six trails—part of the National Recreation Trail network—plus protected bird habitats and a farm and mill that are on the National Register of Historic Places (and now home to the Cherry Hill Arts Center). Also in town, Barclay Farm National Recreation Trail navigates wetlands, ponds, forests and riparian landscapes, and links up with the tranquil Cooper River Historic Trail. In Medford, Woodford Cedar Run Wildlife Refuge—preserved in the 1950s by a couple of nature lovers named Jim and Betty Woodford—includes an easy, one-mile (wheelchair accessible) trail with views of the Cedar Run Lake and a wildlife rehabilitation hospital. Educational programming ranges from kids’ activities to nighttime nature walks. And Moorestown is home to the Boundary Creek Natural Resource area, with wetlands and riparian habitats crisscrossed with boardwalks, viewing platforms and blinds from which to view resident and migratory birds. The park was created just a few years ago on land purchased from the developer Toll Brothers as open space. But if hearing the occasional rattle of a truck on a distant highway is too much congestion for you, Wharton State Forest beckons: New Jersey’s largest state park, straddling Burlington, Camden and Atlantic counties, is a birdwatcher’s haven, populated with great blue herons and screech owls. Trails—including a connection to the Batona—are open to bikers and hikers, while canoeing is also possible along the Mullica and Oswego rivers. For the real off-the-grid experience, though, nothing beats an honest-to-goodness ghost town. Fortunately, the Pine Barrens contains several of them, some of which have been preserved and others of which have been forgotten. Batsto Village, a company town that once flourished on bog iron, has been kept up as a token of living history, while the old paper mill once at the heart of Harrisville Village has been left to crumble into romantically overgrown ruins. Farther southeast in Burlington County, the Batona Trail runs through Bass River State Park, a retreat that encompasses more than 27,600 acres, including an incredibly rare pygmy forest—the largest one in the world. The park also offers swimming in Lake Absegami, which, like many of the lakes, streams and waterways in the Pine Barrens, is dyed a rusty brown hue by tannic acid leached from cedar roots. Published (and copyrighted) in South Jersey Magazine, Volume 9, Issue 4 (July, 2012). For more info on South Jersey Magazine, click here. 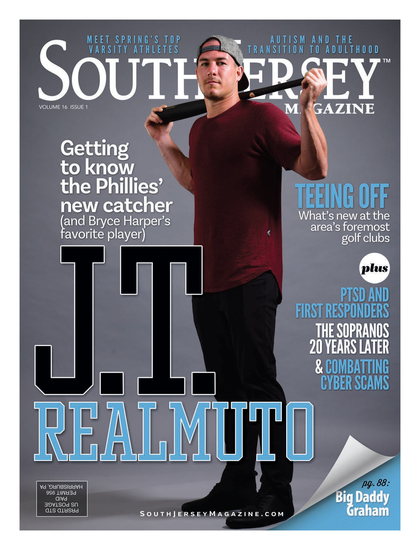 To subscribe to South Jersey Magazine, click here. To advertise in South Jersey Magazine, click here.